Ubisoft launched their Hall of Fame Edition for $29.99 over the digital edition of the base game marked at $14.99. The Hall of Fame Edition includes the G.I. Joe, He-Man, Cobra, and Assassin’s Creed packs – absorbing some of Ubisofts other trademark brands into the playful miniature world of plastic destruction. SAN FRANCISCO — August 13, 2015 — Today, Ubisoft® and Signal Studios announced that Toy Soldiers: War Chest is now available for Xbox One, PlayStation®4 computer entertainment system, and Windows PC. The standard edition of the game can be purchased digitally for $14.99, while the Hall of Fame Edition is available digitally and at retail for $29.99. Toy Soldiers: War Chest is a fast-paced genre-bending mix of strategy defense and action gameplay that brings to life iconic childhood toys and action figures. The Hall of Fame Edition introduces new licensed armies based on classic action figures from the ‘80s and ‘90s – He-Man™ and the Masters of the Universe™, G.I. JOE led by Duke, Cobra Commander, and together with Ezio and the Brotherhood of Assassins. Players can also choose between four themed armies found in the standard edition - Kaiser, Starbright, Phantom and Dark Lord, each with their own gameplay style and abilities. With the standard edition, players will have the opportunity to download individual Hall of Fame licensed armies or all four in the Legendary Heroes pack. Toy Soldiers: War Chest lets players re-create imaginative battles in three gameplay modes including campaign, multiplayer and co-op. In the campaign mode, players must balance strategic prowess and resources while maintaining a steady trigger finger throughout 15 maps. In multiplayer, armies will go head to head to see which toy box wins. Co-op allows two players to team up and play through any map on the same console via split screen or, for the first time, online. Also new to the franchise is 2 vs. 2 multiplayer that allows up to four friends to form two teams and take turns defending their toy box while preparing their next wave of offensive attacks. Players can also test their endurance in Weekly War and Survival maps. Weekly War maps offer fresh new challenges not seen in the campaign mode. Survival maps let players take on the four licensed Hall of Fame armies to see how long they can survive a never-ending wave of enemies. 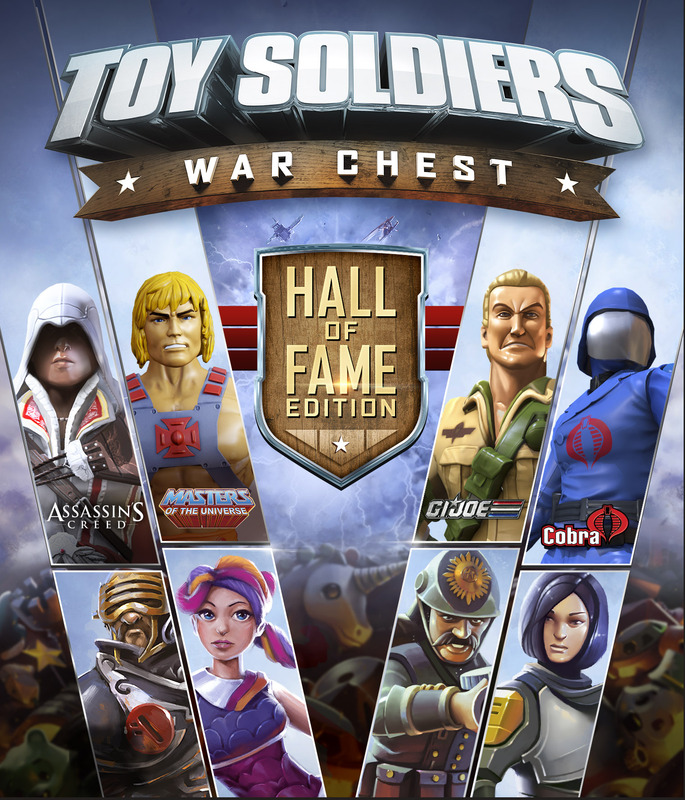 Toy Soldiers: War Chest Hall of Fame Edition will also be one of the new digital games featured in Microsoft’s Summer Spotlight on Xbox One during the game’s launch week. For more information on Toy Soldiers: War Chest, please visit toysoldiers.ubi.com.